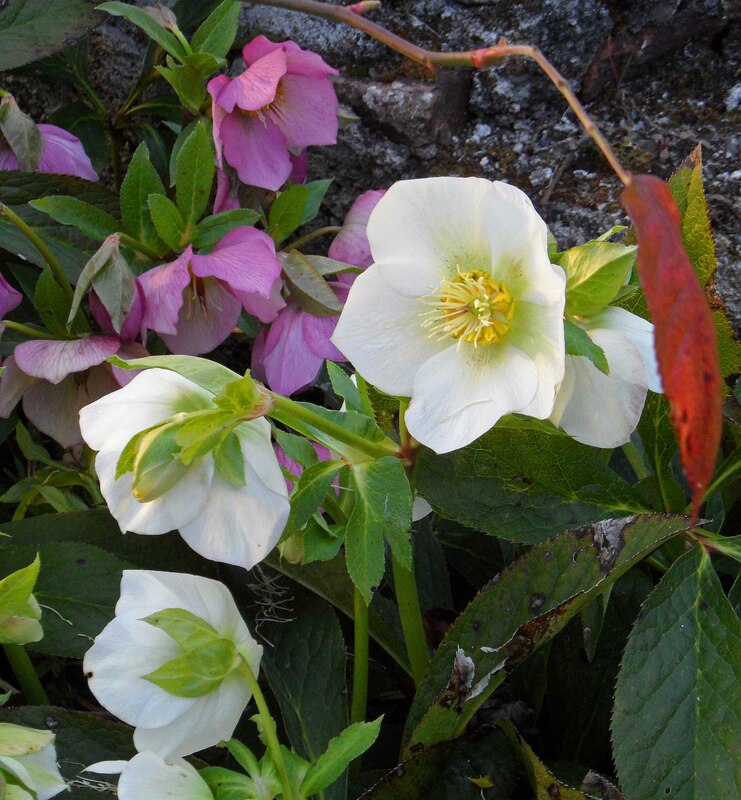 I grew lots of Helleborus Orientalis in Scotland- they loved the rich, moist soil and I loved them. Tall flowers standing straight, and exotic-looking leaves that lasted all year, giving a jungly look to a damp Scottish garden. 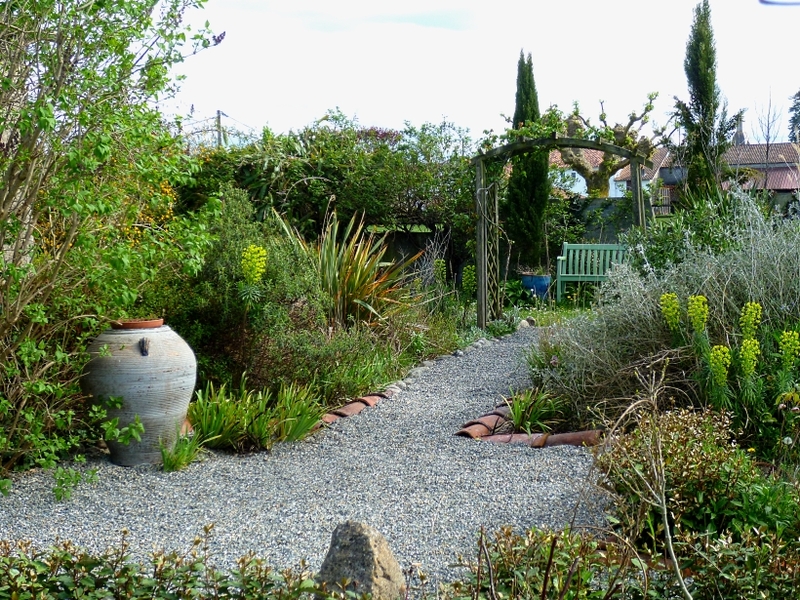 Beth Chatto’s book about converting her carpark into a gravel garden inspired me to try them here, in much drier and hotter conditions in the summer, but surprisingly perhaps, not so different from Scotland in the winter and spring. Here is a very useful blog article for more information about Hellebores and that makes them tick. Thanks http://www.yougrowgirl.com. To be honest, I have no idea what I have got growing in the garden, with one or two exceptions. I have accumulated plants on a willy-nilly basis, lots from no-tag bin-end sales over the years, and of course, the one thing about Hellebores is that they self-seed wildly and mix it up, so the only thing that I do is to try and pull out the spindly seedlings and go for those with nice, strong-looking foliage. I also don’t cut old leaves off. Mainly because, even in this dark winter, the hellebores seem to race to produce flowering buds and they are all in place before I have even got round to thinking about trimming the foliage. Actually, mine don’t seem to get too much black fungal action on them, so I live with a few dark splotches. There are many who say, like Anne Wareham at Veddw, that the very best thing is to grow them in pots and lift them up on stands so that you don’t have to lie down to see into the flowers. But one of their charms, in my view, is their nodding-ness. The top photograph reminded me of a scene from Margaret Atwood’s ‘The Handmaid’s Tale’ somehow, and below is part of the same group from a different angle. These have all inter-mingled, and it is true that not everyone likes the somewhat muzzy pink colouring that can become the only colour around. But there is an apple-blossom freshness about this pink colouring that I am really appreciating this winter for it’s sense of optimism. I think I am fondest of the white and the dark red varieties that I have. The single whites are almost indestructible, bearing their flowers with pride for days and days, and even when nearly over, each flower stays put. People seem to suggest that the double varieties are less robust, and I have only a couple, but I would agree with this- and, of course, there are those who find them too frilly. But I think that if you stay with the basic colours, and don’t opt for the new pistachio varieties for example, the straightforward double white is so classic and pretty, it’s hard to beat. My Stephen Roff ( a very good ebay seller) double red hellebore, bought last year very small, has flowered, and is matched by a single with a lovely collar. It could be that I prefer the collared single….but they are both the richest, darkest burgundy colour which is not reproduced well here in my photographs. 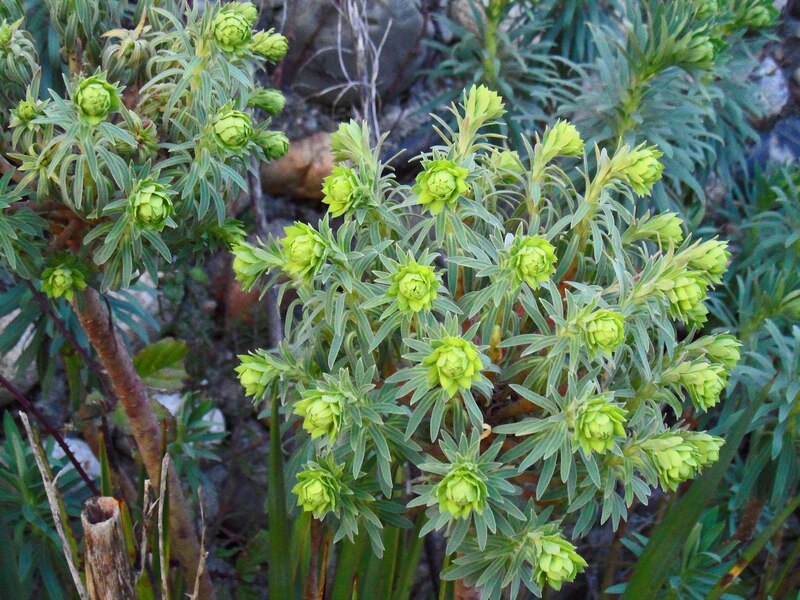 Two species Hellebores that I adore are Helleborus foetidus, and also Helleborus argutiflorus Corsicus. The latter got in with a bad crowd of Hellebores and has now mutated into a not very inspiring cross, but here it was in 2015, with the spikier leaves and the mint-green to white flowers, very simple but gorgeous. I am going to invest in three more plants to start again. Foetidus, often referred to as the ‘Stinking Hellebore’ doesn’t stink at all to me, and can look amazing as it rises up out of the deadness of the border. Not yet this year, but back in 2015 on a sunny evening, the gorgeous purply-red colouring at the fringes of the petals suddenly came alight- and yes, the flowers do last for at least 2 months. What do you think, Tony Tomeo? Never mind the politics on either side of the Channel, at the moment, we have hurtled from mid-Spring to high summer with barely a heartbeat between. The last 3 weeks have been so warm and sunny that everything in the garden is straining at the leash, but, at the same time, short and depleted as we have had no rain to combat the sudden warmth. I have never had to seriously water tulips in pots before. So bizarre and a bit worrying, all out of joint somehow. But, on the positive side, it is rather wonderful to see almost all the roses in the garden out together, rather than the Banksiae rose being a solo turn for at least a month. The downside is that the normally tall and wafty Thalictrum aquilegifolium (usually 1.5-2m high) is under a metre high, still, from a photography point of view, it is amazing to be so close to the powderpuff flowers, and on a sunny day against the dark stream bank, it looks almost spectral. It isn’t possible to do any weeding at all as the soil has baked dry, and so the weed friends are having a great, if slightly dwarf, experience, and there are parts of the garden that I haven’t made it round to yet. 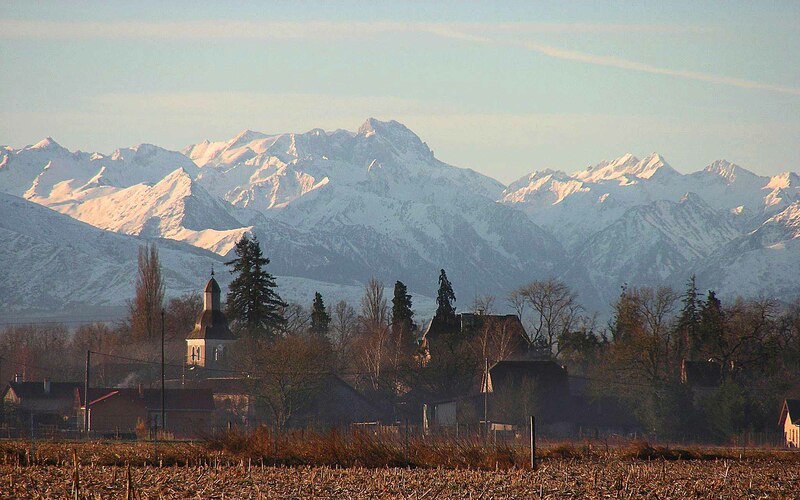 The penalties of being away, having lovely friends to stay and the weather- never mind. I am currently enjoying, though she can be quite tart (! ), ‘The Deckchair Gardener’ by Anne Wareham, which reassures my dutiful-daughter persona that nothing will be lost by weeding later or not at all! Sticking with the roses briefly, here they are, looking the best that they have for years. For them, I suspect, the drought is not too problematic as they are really well-established, but the warmth has been accompanied by cool, refreshing nights and so this may be really suiting them down to ground. I adore this blousy old rose, which I think is ‘Crepuscule’. It has gorgeous, warm, coppery colouring which fades to a creamy yellow and apricot- and a sweet, deep scent. It doesn’t produce many flowers but they are all worth the wait. ‘Jacqueline du Pré’ is a rose that I once attempted to smuggle back from the UK in hand luggage, but gave it up as a bad idea. It now lives happily in Shropshire with my friend, Jane. But last year, it appeared in France and so that was the green light. It is only an infant but even now, has four beautiful flowers, which are probably going to be smashed by the heavy rain that we are finally promised this afternoon. So I dashed out to take it’s portrait whilst intact. ‘Pierre Ronsard’ opens to a dark pink, tightly furled centre, with pale outer petals and then settles into domesticity as above, looking, well, pink. But it is a lovely shape and I adore the tightness of the furled petals. Useless for insects unless they had mining equipment, but lovely all the same. 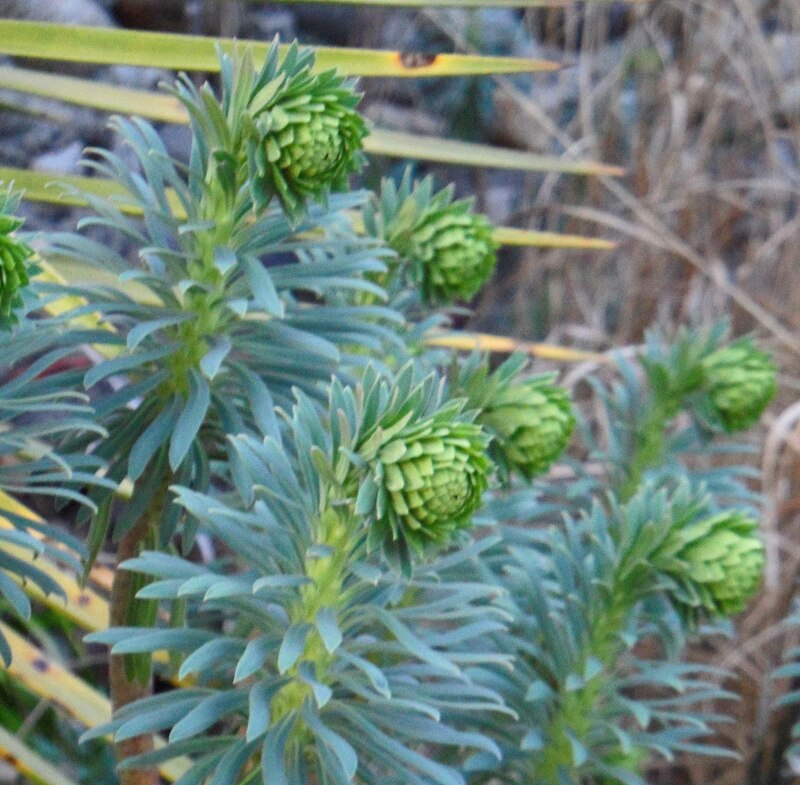 MAC is curently flowering amongst the euphorbias, and other remnants of Spring, in a dry and sandy location- but it is looking fabulous, hurling itself over a wall and shooting up in the air. What an extraordinary athlete this rose is. I can’t recommend it enough as totally trouble-free rose- and it flowers off and on all summer in spates. Looking for a thornless, trouble-free climbing rose that needs a little support, but after that, will dig in forever- ‘Zephérine Drouhin’ is the one for you. Lipstick pink is matched with bright green foliage and she now measures about 4m x 3m with me, and is still going up, draping herself very nicely over the end of the house and the covered barn. She is a showstopper when in full flow, which is expected to be next week once the rain passes over. It’s like this, you see. I find myself in the garden, looking closely at plants, and then I hear myself talking to them. Mostly, I am saying congratulatory or encouraging things, or passing on a compliment. Occasionally, there is the pep talk, something like ‘Now look, you’ve got all you need, so up and at it’. Actually, come to think of it, that’s got quite a parental feel about it, a bit too Critical Parent, if you remember Transactional Analysis. But there is also the serious telling-off to the last-chance saloon plant, the one that’s had two strikes and is on the last one. After which, the compost heap is the destination. I have to say, it’s taken me a while to not keep trying to save plants from the compost heap. 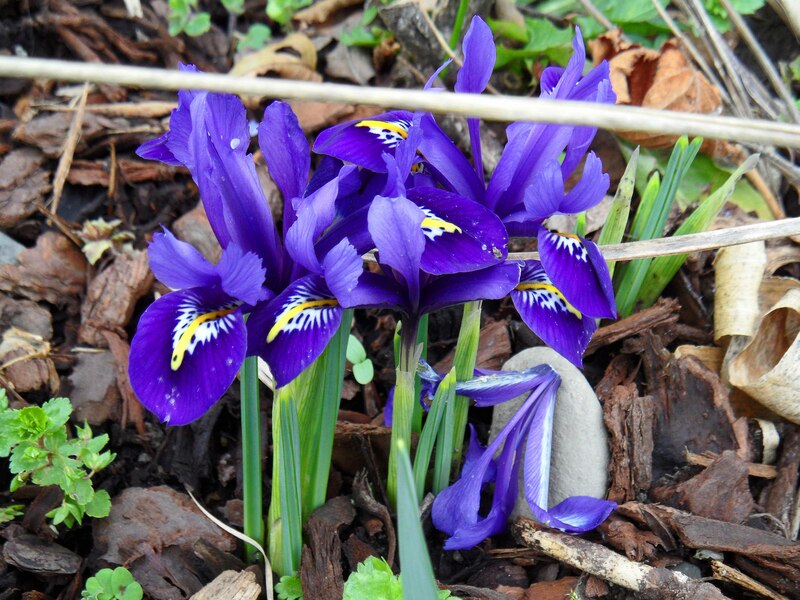 I have learnt to admit that I change my mind about liking plants, and that is my prerogative. 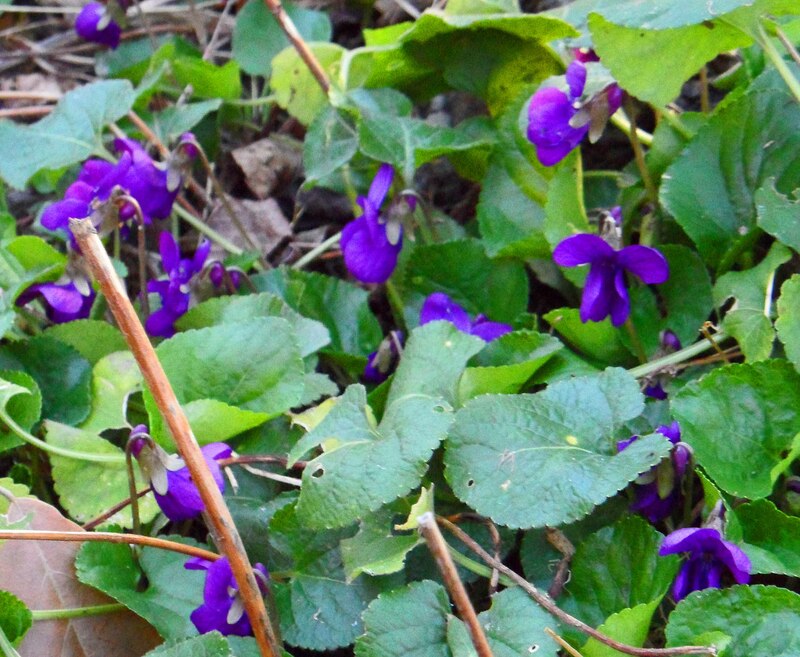 Wild violets, Viola papilonacea, growing in the paths, March 2015. I am saying, ‘You look lovely, but this is FAR enough. I will take you out..’. Apologies to Liam Neeson.